Bambi My Mini Travel Memory Foam Pillow packs plenty of comfort into a convenient travel size - so you're always ready to relax. Note: Dunlopillo and Bianca discontinued their Memory Foam Travel Pillows - we now recommend the Bambi. Bring along comfort and support wherever you go! When you’re traveling, whether it’s your everyday commute or a holiday, a little bit of comfort goes a long way. The Bambi My Mini Travel Memory Foam Pillow packs plenty of comfort into a convenient travel size—so you’re always ready to relax, no matter how uncomfortable your train, bus, or plane seat. 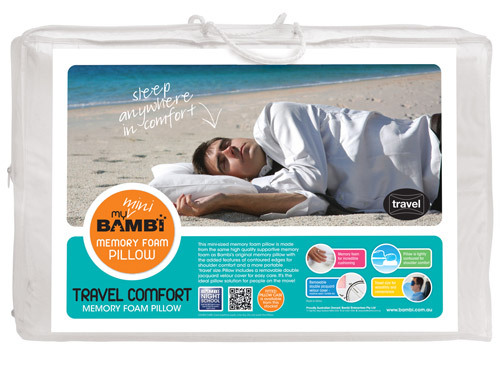 The Bambi My Mini Travel Memory Foam Pillow is more than just comfortable. 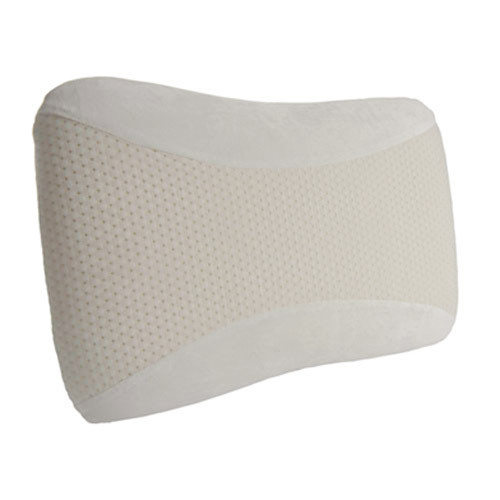 This pillow is designed to mould itself into the ideal shape at your neck and provide proper support for your back. No matter where you’re sitting, the memory pillow helps to correct your sleeping posture and lets you truly relax while traveling. Its contoured edges provide shoulder comfort. Conveniently travel sized at 55 x 36 x 12 cm, the Bambi My Mini Travel Memory Foam Pillow is made from the same high quality supportive memory foam as Bambi's original memory foam pillow. The visco elastic memory foam retains its original shape almost instantly when not in use. The zippered pillow protector is constructed with double jacquard velour fabric, and each pillow comes with a Tencel pillowcase. Note: Dunlopillo and Bianca have discontinued their Memory Foam Travel Pillows - we now recommend the Bambi My Mini Travel Memory Foam Pillow. I wanted a travel pillow I could use to sit /lean/ lay my head on when travelling on a plane, as well as use to bump up the height on a flattened hotel pillow while travelling. And one that would bounce back and not end up mis-shapen. I didn't want a U-shaped neck pillow ... there are 100s of options if you want one of those, but they're only good for one thing. There seems to be a gap in the market for this shape and size, as this was really the only one I could find that fit my needs in the Australian market. Presumably why Bambi can charge this much for a half sized pillow. Unlike some other reviewers, I didn't find this pillow to be too hard at all. Once warmed up with your body temperature, it has a perfect amount of give. To keep it compact when not in use, but on the move, you can roll it and secure with a strap or secure in the elastic cords on a backpack. You can keep that roll shape and put behind your neck for support or pop it in your lumbar, or unroll it and support your head or shoulders. It fits nicely inside a pillow case with a regular pillow to increase height in a hotel pillow. The pillow has gone on several trips with me now - including overseas for a month, and a multitude of plane trips - its still like new.